Hi! I'd like to introduce my DARWIN SKJ. Night scalping of majors (EURUSD and GBPUSD) with medium risk and fundamental filter. Nice return but poor introduction! Investors expect a little bit more of work when introducing a Darwin. Background, methotd, etc, etc... just things you would like to know about the person behing a Darwin you are going to invest in! Consider this just a suggestion! Regards, and good numbers by the way!! I think numbers and statistic of trading are much more impotrant then words. I don't like to speak and promise a lot, but I would be happy to answer any questions. I'll try to raise the curtain and describe the essence of the strategy. Trade is carried out on several instruments, mainly EURUSD and GBPUSD. Opening (as well as closing) of the trades is happen under strict rules of the algorithm during the end of the American session - the beginning of the Asian session. The maximum risk on the trade is limited by the stop-loss. The algorithm provides for a multi-level system for filtering and protecting against a variety of force majeure market situations. According to the real account statistics for the last year (Smply (AlpariRU)): the average profit was 4.8 points, the average loss was 9.8 points. profit trades >82%. The full stop-loss happens rarely, as a rule it occurs in force majeure market conditions, for example, with an unexpected fundamental event. Stop-loss varies from 40 to 60 p. According to the pair and settings. It usually takes 1.5-4 weeks to compensate SL, it depends on the market conditions. Additionally to algorithmic protection of the deposit against force majeure, the trading system also implies a fundamental filtering - no trading or trading with reduced risk in periods when the market is overheated by important geopolitical events, macroeconomic releases, verbal interventions, etc. Thus, the trading system was tested in MT4 on history - more than 8 years, on real accounts of brokers with different trading conditions - more than 1 year. A detailed analysis of the algorithm's error in real trading conditions was carried out in detail in relation to the "ideal" conditions in the strategy tester, which showed that the difference, although it is, is insignificant and practically does not distort the results of the trading. Given this, and also the fact that optimization and testing on history were carried out taking into account all the requirements for this process, it is possible to rely on the test parameters of the algorithm and take them into account when determining the target profitability and risk. 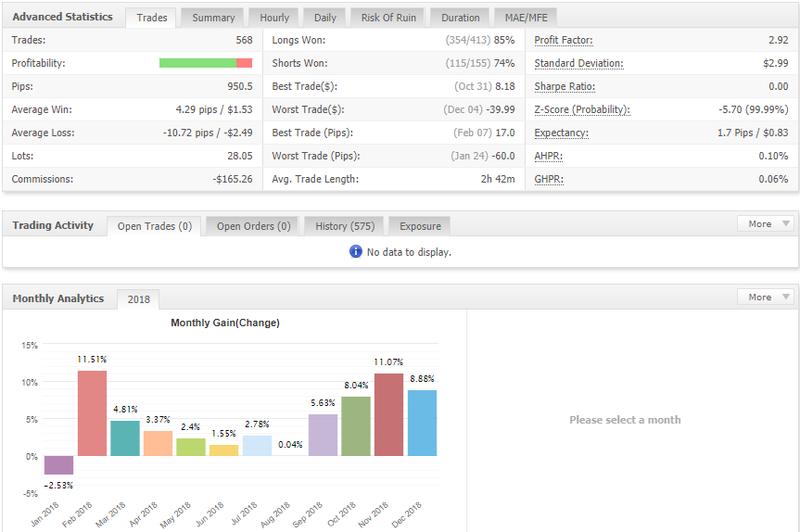 You can watch the results of Darwinex account in myfxbook SKJ (Darwinex). Thank you for this nice update @ghostdenis, that will help investors to identify better if your strategy could suit their needs! Nice track record for now, keep up the good work! The account balance was restored after the last strong drawdown. Unfortunately, the only investor decided to fix the losses and sell SKJ. Well, I respect his decision, although it was reckless. March brought +4.81% to account and +2.33% to SKJ Investors are welcome! SKJ took the 24th place in DarwinIA challenge. Now the SKJ cannot get new investments because of the low parameter "Divergence". I hope the trouble will be solved in 2019th. Great work, the numbers show, good profitability with a very low drawdown. You are in my portfolio for a future, as soon as the problems of divergence are solved. Same here, only thing stopping me investing is divergence. Mine was also high for a while and seemed to be to do with the base currency of my Darwin - what is yours please?